Considered a beacon of hope during the Great Depression, the Rockefeller Center has evolved into a crossroads that celebrates art, history, diversity and the progress of humanity. Envisioned as a city within a city by John D. Rockefeller, Jr., this iconic New York landmark was intended to be a place where workers and visitors alike wouldn’t have to travel far to get what they need. Even today, the 19-building complex is teeming with shops, restaurants, entertainment options, galleries, gardens and recreational activities. But if you are after a well-rounded traveler that goes beyond the touristy sights, make a day of it and take it step-by-step. Start your day with a continental breakfast before taking the 10-minute walk from the Royalton - exit at 44th St, turn right onto 6th Avenue and continue until you hit 49th St. The Rockefeller Center’s main entrance is at 50th St, but there’s plenty to explore between 48th and 51st St.
Once you’re there, you won’t be able to stop staring – at Rockefeller Center, permanent art installations, sculptures and design masterpieces abound. The craftsmanship that has gone into the complex continues to impress visitors, no matter how often they’ve been there. And with the ever-changing displays that mimic New York's fast-paced pulse, there’s always something new happening. 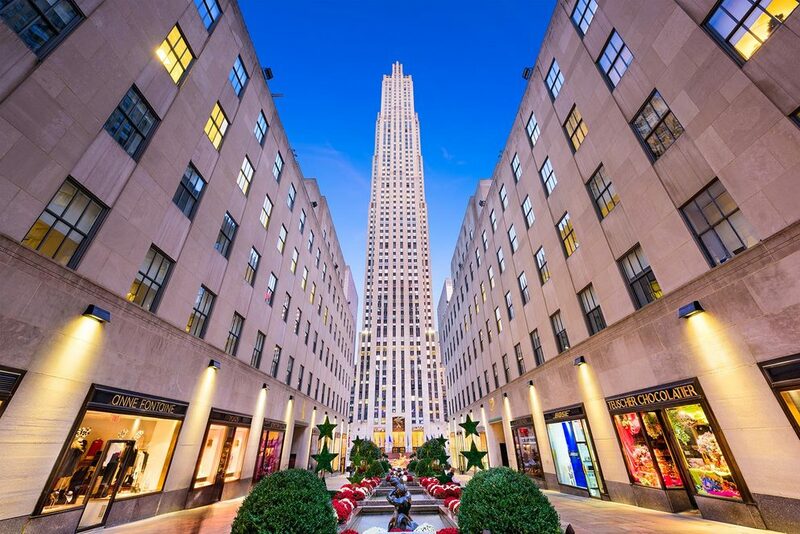 Give the Rockefeller Center Tour a try to get insider’s information on quirky facts, such as the meaning of architectural details or the secrets behind certain sculptures. Although there’s no escaping the first-time tourists, especially if you’re heading to the Top of the Rock Observation Deck, Rockefeller Center offers various ways to enjoy your visit without having to stop for photographs of excited foreigners. Fine dining and bars filter out the visitors and give you the opportunity to soak in the unrivaled views. If your visit falls during the holiday season – you’re in luck. New York’s holiday spirit emanates from Rockefeller Center, starting with Radio City Christmas Spectacular and the Christmas Tree. The world-famous Rink is open from mid-fall to mid-winter. Although November and December are the busiest months, did you know that The Rink is available for private events? If you want to avoid waiting in line, buy the VIP Skate Reservations and get exclusive access to the VIP Igloo. Given the complex’s array of upscale stores and service providers, shopping is always an option. Acquiring everything you need in a single trip is possible – just don’t forget to consult the latest offers. Here’s another tip: browse the official Rockefeller Center’s Front & Center blog to keep-up-to-date with the current events, trends and hidden gems. Given its proximity to the Royalton, walking is the easiest way to get there - come on, it’s just half a mile away! With so many exceptional experiences to have at the Rockefeller Center, you need a hotel that rises to the challenge. Book your room at the Royalton Hotel to be within walking distance of the most exciting area of New York and stay in luxury rooms that preserve the taste and character of New York’s golden years.